I do these drawings of my family for most of the major holidays (click here to see last year’s Christmas drawing and I really had a good time with this year’s Halloween illustration). 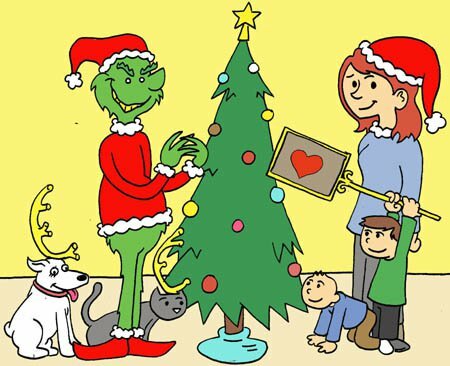 If you’re looking for holiday content, I’ve written up four Christmas Comics Cavalcades this month and I’ve bookmarked them all for you! Check ’em out if you haven’t already. I really enjoyed writing about these books and definitely plan on doing another round in December of 2012. Takin’ the rest of the week off from posting, but I wanted to take a moment to wish everyone a very happy holiday! To be clear: My 7th period students were NOT making fun of me. They genuinely thought my hair looked awesome and I was being fashionable for once in my life. I think the comic works, even if it’s not 100% clear. I am not much of a colorist, but I thought it would be a fun way to spice up today’s comic. Other words I have trouble with, to the delight and chagrin of my students: bagel, awful, forward. 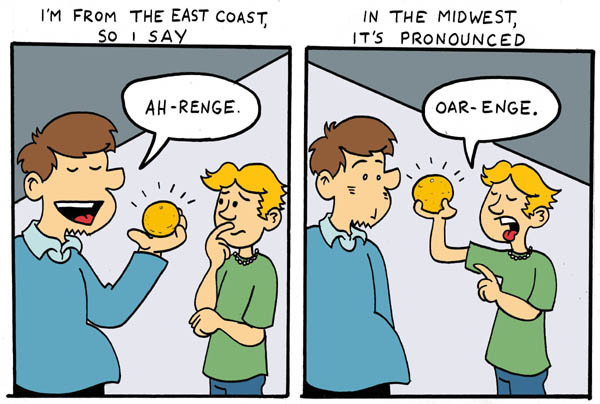 And of course, to be fair, I think EVERYBODY outside of the Tri-State area pronounces it “oar-enge” so I’m not trying to be a martyr or anything. 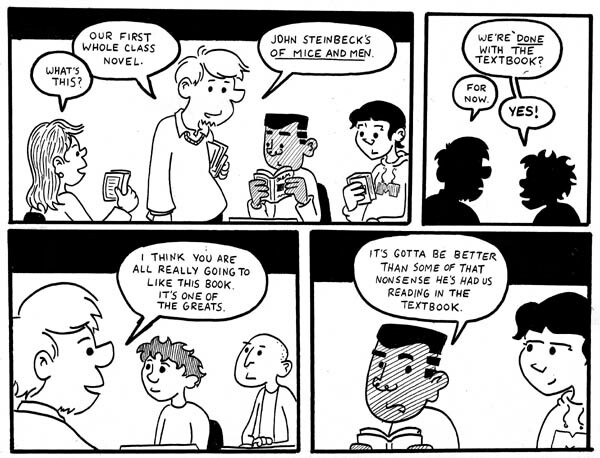 As I mentioned before (but admittedly, not in awhile), I’m not a huge fan of the content in the 10th grade textbook. Neither are my students. 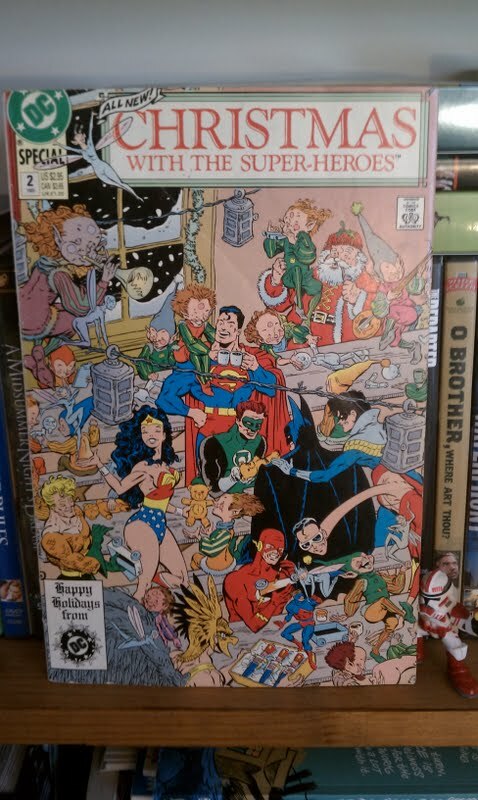 Christmas with the Super-Heroes Special #2, published in 1988 by DC Comics. We’re in firmly entrenched in Exam Week here at my high school. If you are interested in the process, I drew a comic last year which all but tells you exactly what the next four days of school are going to be like. Take a look. I enjoyed this brief post over on NYC Educator about the effectiveness of hiring a tutor for your son or daughter. I’ve both been a tutor AND asked by parents about hiring a tutor for their child. My response to parents is usually, “What do you expect them to get out of the experience?” I’ve had students who probably did benefit from tutoring, but oftentimes you could replace a paid tutor with a watchful eye at home, making sure that Junior is doing his homework. I hate to generalize, but if you do that second thing? Your kid will probably get as much “bang for your buck” as paying a tutor to do the same thing. I’ll remind everyone here that I have a NEW DonorsChoose project posted– I’m trying to get a bunch of new books not for my classroom library, but for our high school’s media center. If you’re interested in helping out but don’t have any funds to do so, please e-mail me at journalcomics at hotmail dot com. If you have five minutes, I have a unique way that you can help support my students. Cartoonist Lucy Knisley is taking every Harry Potter novel and condensing it into one poster-sized comic/illustration. I don’t know what the legal department of Warner Brother/Scholastic would think about this project, but as a fan of Ms. Knisley’s work and Harry Potter, I am excited to get mine in the mail! I picked her take on Harry Potter and The Prisoner of Azkaban, both for how dense the illustration is and the color. Click over, check out all three posters currently up for sale, and wonder how on Earth the artist’s going to fit all of Deathly Hallows onto one page. I also picked up a copy of Alex Robinson’s A Kidnapped Santa Claus for Elliot and Henry… although who are we kidding, I’m excited to read it myself. An adaptation of the L. Frank Baum story of the same name, Mr. Robinson was offering to sketch in any copies ordered direct from the author. I’ve been slowly putting together a nice collection of signed books for Elliot and Henry, and this one will make a fine addition. Alex Robinson’s website can be found here, with links pertaining to A Kidnapped Santa Claus and his other awesome comics. You are currently browsing the Teachable Moments blog archives for December, 2010.